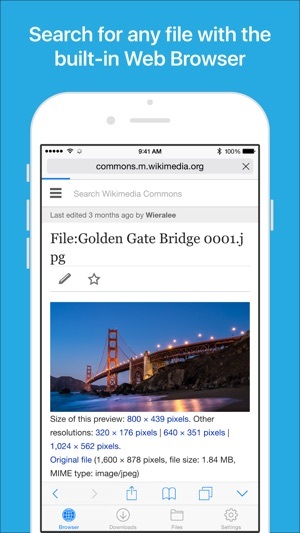 Files (formerly known as Downloads Lite) features a Web browser that lets you save documents to your iPhone or iPod touch so that you can work with them offline. 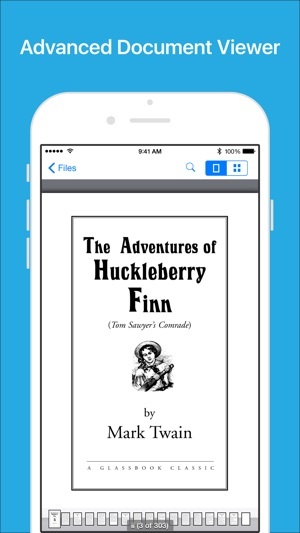 It has a built-in file manager, with robust viewer for all iOS supported document types, powerful photo browser, advanced PDF reader, full Dropbox support, and more. NOTE: This app does not support downloading of audio or video content. - Unified smart search field. Type a URL or search term in the unified smart search field, the browser automatically suggests the closest match to what you’re looking for. - If the browser caught in an endless loop of pop-up alerts, go to the iOS built-in "Settings" app, find "Files", turn on "Recovery Mode", then force-quit and relaunch the app. Long ago, I used the now ancient and defunct “Downloads” app by this developer, even before they changed the interface to match iOS 7’s Music app. I had no idea that it had been removed from the App Store. Seeing that it was incompatible with iOS 11 + iPhone 7 Plus (would always crash upon opening), I had to remove all my files from it and delete it. Then I stumbled across “Files,” from the same devs. I like that Files has same interface and functionality as its predecessor, but some things could’ve changed with the new app. - It could have a dark theme. Looking like Apple Music was cool for perhaps a year. We need a toggle for a dark mode that does not involve smart invert. - Media playback in landscape orientation shouldn’t cover up 2/3 of the album art. Perhaps push it to the left and put media info/controls to the right? - Although simplicity is nice, the web access page could maybe be a bit more graphical. 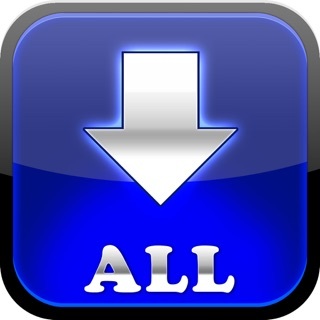 - The web access should have support for uploading multiple files at once without stuffing them in a zip folder. I find that having to scroll back down after each upload to be a pain, especially if the specific folder has a lot of files at its root. 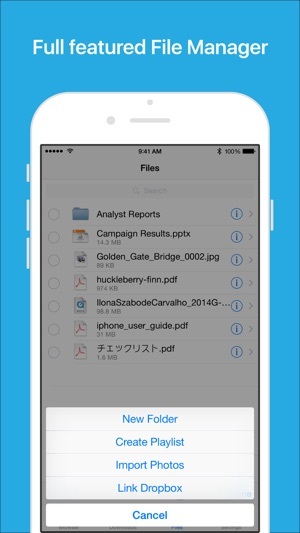 Overall, a great app to store things in, since personally, I don’t trust Apple’s new Files app. 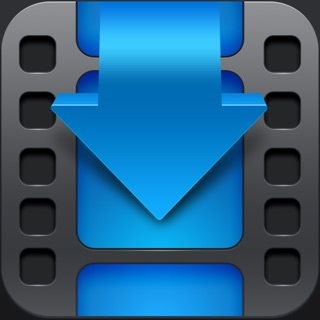 This app does exactly what I need it to do which is download audio and video files. 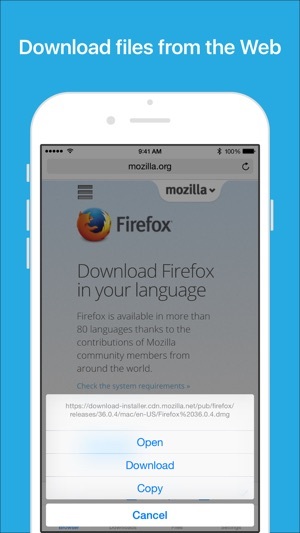 As far as the developer getting rid of his old app (downloads) and coming up with this new one is fine by me. There were probably too many problems with trying to get the old app to work with the new iOS. So sometimes it’s just easier to make a new app. And come on the guy made another app so what if he charges to upgrade it again, are these people on here that hard up for $5 (we all got bills to pay). I enjoy using the app so therefore I have no problem paying again. Go ahead and try to find another app that’s better then this one. I love this app. I used its precursor, Downloads, and it was just as useful. I mainly use it, like the other reviewers, to download music to listen to offline as well as various other files. I have used this particular app every day for over two years and have had no problems. The developer is very slow, however, at keeping the app updated and making it available for newer software updates and fixing bugs. Hopefully he reads these reviews and becomes interested in updating the app. I have had no issues, but with the new phones releasing this week I expect the app not to work with those phones.